“At first I feared him,” said Naomi Namusoosa of that introduction. She was 16 at the time, and he was 21. Mr. Levi, an orphan who helped raise himself and two of his younger siblings up from poverty, was looking for a wife. “A good woman, someone who will be so nice to me, a good listener, and a cook who will not give me a hard time,” he said. Mr. Levi waited for her for three years. Then, in 2013, he returned to formally ask permission to marry Ms. Namusoosa. Mr. Levi, now 28, is the spiritual leader of the Namutumba Abayudaya, one of nine Jewish communities in Uganda that stem from the conversion roughly 100 years ago of a local leader called Semei Kakungulu, who then created a sect. After meeting Ms. Namusoosa, Mr. Levi went to the United States for two years to earn money to pay the dowry promised to his future wife’s family by Ugandan social law. In 2015, he returned with enough that her parents approved. Marriage at first meant joining households and starting a family; talk of a wedding did not come for a few years. Ms. Namusoosa moved with Mr. Levi to his village, where he was soon named successor to Eri Kaidhiwa, then the leader of the Namutumba Abayudaya. Mr. Levi began training, mostly via online conversations from his living room in Uganda, for formal rabbinical ordination through Aleph: Alliance for Jewish Renewal. “We were getting used to each other,” the bride said. There were other reasons for waiting, including the expense of a wedding and the lack of a properly ordained rabbi to officiate. The couple lived together for nearly five years, and had a son, Akiva, now 2, before deciding to have the first Jewish wedding to take place in Namutumba, an effort that displayed the vitality of the Jewish community in their multifaith Jewish, Christian and Muslim community with the rare remaining pantheist. 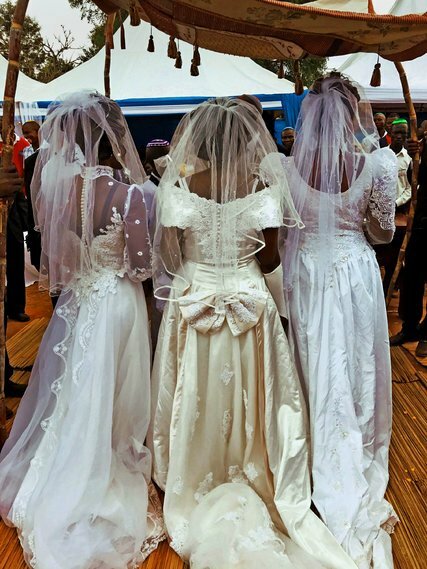 The wedding was so big, a Ugandan radio station reported the news. “We have been studying one another,” Ms. Namusoosa said of their relationship. They were finally ready to marry. Mr. Levi’s village was a serene place days before the wedding. The town is off the grid, with little electricity and still, for many, little food. Children have died in recent months because of famine, and many families subsist on a single meal a day. The water comes from a pump, the movie theater is a mud hut with wooden benches and a 1980s television blasting 1970s films. There is a church, a mosque, a synagogue, a few hair salons and a dressmaker. There is nothing flashy. Along with Mr. Levi and Ms. Namusoosa, Jacob Ntuuko, 58, wed Rachael Naigaga, 52; David Kalireku, 62, wed Ruth Nabaigwa, 56; Moshe Isiko, 60, wed Naume Lunyato, 50; and Mr. Kaidhiwa, 72, the man who chose Mr. Levi as his successor, wed a very pregnant Rachael Kontono, 38, during one monumental service. The ceremony was conducted in Luganda, English and Hebrew. Rabbi Sizomu, a member of parliament, was ordained by the Conservative Jewish movement in the United States. Rabbi Chase, a representative of Kulanu, an organization that supports isolated Jewish communities around the world, was ordained by Aleph. “I believe for the Abayudaya, it has never happened to have an outside rabbi come and wed people,” Mr. Levi said of Ms. Chase, whom he had met at an Aleph rabbinical training retreat in Stony Point, N.Y. In the week before the ceremony, Ms. Chase met with leaders in the village, helping to negotiate Ugandan and Jewish law, and also led premarital counseling with each couple. A day before the ceremony, the beginning of the wedding was marked by the slaughtering of a cow and chickens, a huge sacrifice for a community subsisting on rice and sweet potatoes and the occasional doughy fried bread. That night, formal prewedding festivities ensued at 9 o’clock, when the full moon appeared overhead. A D.J. arrived from the nearby city of Kampala, transforming the quiet area into a massive all-night trance dance, neon lights and all. Only a few slept that night. Hundreds of people, ages 4 to 94, including Ms. Namusoosa and Mr. Levi, danced to everything from Justin Bieber to the local Ugandan pop star GNL Zamba, Afro-reggae, Afro-techno and beyond. All night long, while the music bumped outside the courtyard walls, inside the Levi family compound dozens of relatives gathered around hundreds of sweet potatoes, bananas, yucca and russet potatoes, all to be peeled, sliced and sorted in preparation to feed 1,500 people. By 4 a.m. on the day of the wedding, while the trance continued outside, enormous banana leaves for cooking were heaped in piles, babies slept under small mosquito nets next to women curled on straw mats, and Rabbi Chase and her 12-year-old daughter, Ariel, somehow slumbered through it all. By 5, what appeared to be a city of tents erupted in the dark around the compound, as if a small Burning Man festival were being born. The music stopped at 6 on the nose. By 8, all was calm, reordered. In just 24 hours the simple green village had been transformed into something of an urban dreamscape. Gum and water and snack vendors showed up, police officers regulated growing crowds, and a fleet of vehicles arrived on what had been the dirt dance floor. The wedding entourage came in beribboned vans accompanied by women dancing and chanting to welcome the brides and grooms. Mr. Levi arrived first, dressed in a white suit with a black bow tie and wearing sunglasses. His sons, Oren, 12, from a previous relationship, and Akiva, stood by his side in matching outfits, sunglasses and the signature locally hand-knit Jewish kippot on their heads. Soon thereafter, Ms. Namusoosa, in full bridal regalia with a bodice of lace and a waist-length veil, floated like a queen across the earthen floor, trailed by bridesmaids chosen from the local schools. Following the couple were four more brides, four more grooms and four more wedding parties. The weddings took place in a circle of tents packed with spilling crowds at every turn. Floral bouquets peppered the area, and a huppah, with posts made of sugar cane stalks for a unique Namutumba touch, was held up by local Jewish youth group leaders. In the midst of the ceremony, as five couples and two rabbis under one huppah were poised to sign the ketubahs, the traditional marriage contracts, the skies turned an ominous dark gray. The D.J., who had continued to spin beats throughout the ceremony, stopped. Rabbi Sizomu quickly escorted the wedding party off the stage, the tents covering only the guests. Taking shelter seemed premature. But a minute later the sky opened, the tents blew wild and untethered, and the rain came all at once in a severe downpour. The brides kept smiling. The guests sat and watched as if nothing had happened. People were patient, stretching time and moments, sitting still as if the rain and the long wait, almost an hour, were part of the engaging service. In time the kosher, halal and other food stations served each according to their needs, in the mud and rain. The wedding costs were “paid for by our friends,” said Mr. Levi, who raised money in Uganda and the United States to help. “I want our community members to live, not the life I went through,” he said, explaining why he arranged such a lavish ceremony. Inside the Levi family living room, the brides and grooms and their closest family members gathered, practically on top of one another, sheltered from the storm. When it was clear the heavy rain would not soon subside, the rabbis continued to lead the wedding ceremonies away from the crowds still outside. It was hot, there wasn’t much air, and they proceeded with the breaking of the glass and the signing of the contracts, which had been translated from Aramaic to English to Luganda by Rabbi Chase and Rabbi Sizomu for the occasion. On the Groom In addition to Ray-Ban sunglasses and a skullcap hand-knit by his brother, the groom wore a kittel purchased for him by his mentor from the Aleph program in the United States, Rabbi Leila Gal Berner. A kittel is a white pocketless linen robe. This traditional Jewish garment is worn by religious men on their wedding day and is the same garment they are later buried in. On the Brides The Western-influenced bridal gowns were purchased in Mbale, a larger city with a denser Jewish population, because shopping options are limited in the Namutumba region. Diverse dining To appeal to the interfaith crowd (Namutumba is a Muslim, Christian and Jewish district), certified halal and kosher sauces were prepared separately to meet the dietary restrictions of the wedding guests. Indian-influenced dishes including peanut fish curry and chapati, an Indian flatbread, were staples on the wedding menu and strongholds in the local diet.